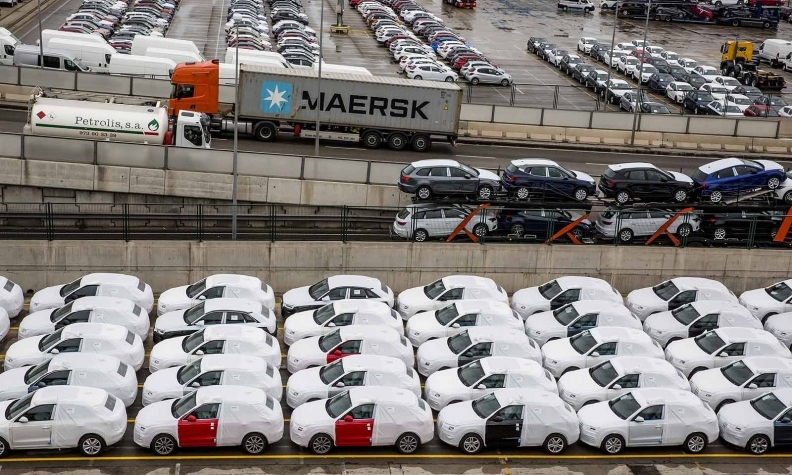 New Audis on a freight train and dockside are set for loading at the port of Barcelona, Spain, on March 15. The Trump administration on Wednesday launched a national security investigation into car and truck imports that could lead to new U.S. tariffs similar to those imposed on imported steel and aluminum in March. The Commerce Department said the probe under Section 232 of the Trade Expansion Act of 1962 would investigate whether vehicle and parts imports were threatening the industry's health and ability to research and develop new, advanced technologies. "There is evidence suggesting that, for decades, imports from abroad have eroded our domestic auto industry," Commerce Secretary Wilbur Ross said in a statement, promising a "thorough, fair and transparent investigation." The move opens a new front in Trump's "America First" trade agenda aimed at clawing back manufacturing jobs lost to overseas competitors. In addition to the 25 percent tariffs on steel and 10 percent tariffs on aluminum, the administration has threatened tariffs on $50 billion worth of Chinese goods over intellectual property complaints. It is also trying to renegotiate the North American Free Trade Agreement to return more auto production to the United States. The Commerce Department said the probe would determine whether lost domestic production had weakened the U.S. "internal economy" and its ability to develop connected vehicle systems, autonomous vehicles, fuel cells, electric motors and batteries, and advanced manufacturing processes. In a separate statement, President Donald Trump said: "Core industries such as automobiles and automotive parts are critical to our strength as a Nation." A Trump administration official said before the announcement that the expected move was aimed partly at pressuring Canada and Mexico to make concessions in talks to update NAFTA that have languished in part over auto provisions, as well as pressuring Japan and the European Union, which also export large numbers of vehicles to the United States. Earlier on Wednesday, Trump teased the announcement in a tweet: "There will be big news coming soon for our great American Autoworkers. At a meeting with automakers at the White House on May 11, Trump told automakers he was planning to impose tariffs of 20 percent or 25 percent on some imported vehicles, sources told Reuters and specifically criticized German automakers for exporting a large number of vehicles to the United States. An ad hoc industry group representing the largest Japanese, German and other foreign automakers called "Here for America," criticized the effort. Bozzella noted 12 million cars and light trucks were produced in the United States last year. "To our knowledge, no one is asking for this protection. This path leads inevitably to fewer choices and higher prices for cars and trucks in America,” Bozzella said. 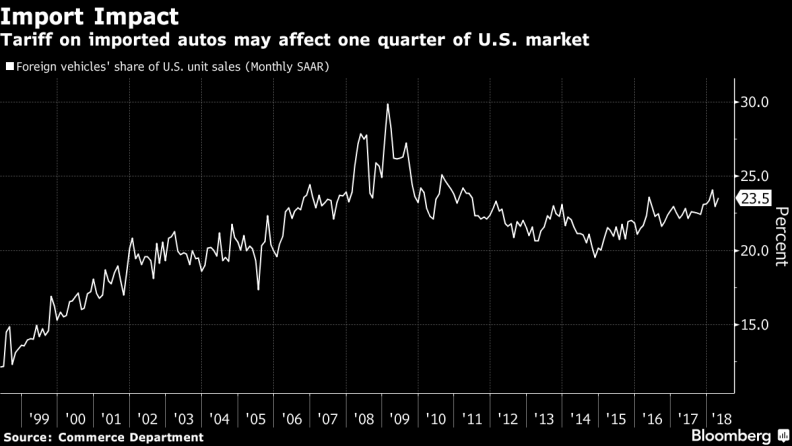 Trump has railed against European auto imports and tariffs. “If the E.U. wants to further increase their already massive tariffs and barriers on U.S. companies doing business there, we will simply apply a Tax on their Cars which freely pour into the U.S.,” Trump wrote on Twitter in March. “They make it impossible for our cars (and more) to sell there. Big trade imbalance!" German automakers Volkswagen, Daimler and BMW all have large U.S. assembly plants. The United States is the second-biggest export destination for German auto manufacturers after China, while vehicles and car parts are Germany’s biggest source of export income. A Wall Street Journal report earlier on Wednesday that the administration was considering launching a Section 232 investigation into auto imports that could see import tariffs of up to 25 percent imposed caused U.S. automaker shares to jump and hit those of overseas companies like Toyota Motor Corp , with its New York-traded shares falling 0.67 percent. The United States imported 8.3 million vehicles in 2017 worth $192 billion, including 2.4 million from Mexico, 1.8 million from Canada, 1.7 million from Japan, 930,000 from South Korea and 500,000 from Germany, according to U.S. government statistics. At the same time, the United States exported nearly 2 million vehicles worldwide worth $57 billion. Asked if the measures would hit Mexico and Canada, a Mexican source close to the NAFTA talks said: “That probably is going to be the next battle."